Something very familiar and something relatively new (to me) for this latest posting. 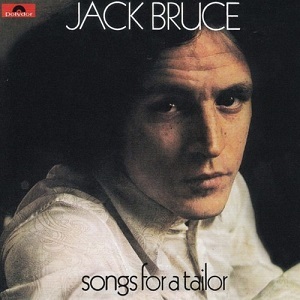 As a body of work Cream co-founder Jack Bruce’s solo music remains curiously underrated in 2018, a little over three years since he passed away aged 71. In part this may be down to the fact that he was never quite able to equal his astonishing debut, Songs for a Tailor, released in 1969 shortly after the end of Cream – but that should not negate closer inspection of the frequent brilliance of later albums such as Out of the Storm, Shadows In the Air and, especially, Monkjack. But first a few words about Songs for a Tailor, whose 10 short tracks – their total playing time amounting to less than 32 minutes – continue to enthral with their structural and lyrical ingenuity. Working once again in partnership with his long-term co-writer, lyricist Pete Brown, Bruce sounds liberated after the messy demise of Cream. It is perhaps no surprise that these songs are shorn of the guitar heroics that characterised his former band, as Bruce’s own bass, piano and organ are foregrounded in the arrangements. With additional but crucial colour provided by brass and strings, Songs for a Tailor could be crudely categorised as ‘chamber pop’, but the sophisticated chord progressions and harmonies set it apart from many other occupants of the genre. Distinguished by sudden twists and abstract imagery, Pete Brown’s lyrics are – as they have been throughout his career, in whatever collaboration he has found himself – an absolute delight. Who knows quite what ‘Rope Ladder to the Moon’ is about, and really, it need not detain us when the words are so entertainingly oblique and allied to Brown’s undulating bassline and baroque-pop strings. Much the same might be said of ‘Weird of Hermiston’ and ‘Tickets to Waterfalls’, which contain more than their fair share of arresting, oddly unsettling images. In short, Songs for a Tailor sounded like nothing else released in 1969, and in today’s ambition-averse pop landscape sounds almost insanely creative. The performances are something special, too, especially those from the multi-instrumentalising Bruce. His vocals, too, are more measured and powerful than many of those cut during his Cream days. Bruce and Brown would continue to evolve their own brand of ‘art song’ throughout the 1970s on a series of albums that always had at least 3 or 4 standout tracks apiece. But 1974’s Out of the Storm was pretty much all great, its eight elaborate songs often underpinned by a sense of loss and sadness – no wonder, perhaps, given that Bruce was struggling with heroin addiction at the time. It would take him a long time to kick the habit, and by his own admission it had a hugely negative impact on his late ‘70s and ‘80s output, although the production traits of the day – notably an overly ‘bright’ sound and preponderance of sequencers and synths – didn’t exactly help. So to contemporaneous long-term followers, the release of Monkjack in 1995 must have seemed like a substantial artistic renaissance. Previous LP Somethin Els had hinted that he was emerging from the darkness of the previous 20 years (something confirmed by Harry Shapiro in his excellent 2010 authorised biography of Bruce, Composing Himself), but on Monkjack he seemed to be in total command of his material once again. And any risk of over-production is neatly circumvented by the entire album featuring just Bruce on piano and vocals, and Parliament/Funkadelic keyboard legend Bernie Worrell on Hammond B3 organ. The relative sparsensess of the arrangements only serves to enhance the songs’ inherent drama, particularly on the likes of the near-eight minute ‘Laughing on Music Street’ – easily one of the most ambitious songs in the entire Bruce catalogue. The cumulative effect is akin to what used to be called a song-cycle, although the thematic content is as richly diverse as one would expect from the Bruce/Brown partnership. And Brown is on phenomenal form vocally and at the keyboard. It is to be hoped that there will be a wider reappraisal both of Monkjack – which is currently out of print on CD – and the wider Bruce/Brown repertoire in the years ahead. As a partnership the closest comparison I can think of is that between Jerry Garcia and Robert Hunter, whose co-writes for the Grateful Dead (think ‘Terrapin Station’ or ‘Scarlet Begonias’) offer a similar blend of ambitious songscapes and densely poetic lyrics. Both teams were restlessly creative until the end, their writings informed and enhanced by the kind of curiosity-driven broad reading that is sadly unfashionable now. It seems improbable that we will see their like again. By contrast to Bill Frisell, Keith Jarrett’s work has been part of my regular listening for many years. The jazz pianist and composer – who has in latter years proven himself to be an equally adept interpreter of classical pieces – is a veritable force of nature and, I would argue, one of modern music’s most important figures. Through his willingness to draw on traditions associated with genres outside of his ‘home’ territory of jazz, and explore arrangements that are far from conventional, Jarrett has pushed instrumental music into all manner of new and exciting shapes. Broadly speaking, Jarrett’s career can be divided into two phases – before and after the chronic fatigue syndrome that beset him in the 1990s and resulted in long stretches away from both the studio and the stage. In phase one, he had been a prolific recording artist in various configurations – solo, small group, larger ensemble – with his own pre-written compositions to the fore. In phase two, studio recordings would become few and far between as he concentrated on live work with his extraordinary trio featuring Gary Peacock on bass and Jack DeJohnette on drums – although over time he would also return to the solo improvised performances that helped to propel him to global recognition in the early 1970s. On which note there is no doubt that his most influential individual release remains 1975’s The Köln Concert. The best-selling piano album of all time with sales exceeding 3.5 million, The Köln Concert's iconic status rests both on its extraordinary, wholly improvised flights of fancy and its individual character in the Jarrett catalogue. That character is partly attributable to the deficiencies in the upper and bass registers of the piano rented for the concert, as a result of which Jarrett focused more on the middle section of the keyboard. Notwithstanding these challenges, the performance was utterly mesmerising, and has lost none of its potency more than 40 years later. If you care about piano music at all you cannot be without a copy. 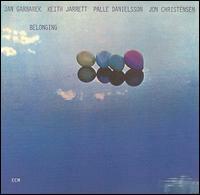 But it wasn’t my own entry-point to Jarrett’s work – that was the previous year’s Belonging, recorded in Oslo with his European quartet of Jan Garbarek (saxes), Palle Danielsson (bass) and Jon Christensen (drums). And what led me to that album was the similarity of one of its tracks, the infectious ‘Long As You Know You’re Living Yours’, to the title track of Steely Dan’s album Gaucho, released six years after Jarrett’s album and a long-term personal favourite that I will return to in the coming weeks. Indeed, it was a bit too similar as it turned out; Jarrett cited copyright infringement and was subsequently added as a co-author of the Steely Dan song. Although the gospel-tinged ‘Long As You Know…’ is undoubtedly one of the album’s strongest pieces, there are plenty of other highlights on an album that is perhaps Jarrett’s most diversely satisfying. The tense ‘Spiral Dance’ is a powerful opener that exemplifies the chemistry of this still-underrated quartet, whilst ‘The Windup’ – based around a complex, compelling melody that recurs throughout – is still one of Jarrett’s most popular compositions. But it would unfortunate if any negative perceptions of Jarrett’s public persona were to discourage any potential listeners from exploring one of the most rewarding catalogues in all of jazz. Ceaselessly creative, intellectually rigorous, and massively gifted both melodically and harmonically, Jarrett’s work can – once discovered – provide a lifetime of delights. And there is no place better to begin than Belonging.